The Coalition for Fiscal and National Security is a bipartisan group of highly distinguished and respected leaders in defense, economic, and national security policy, who have served during eight Presidential administrations (both Democratic and Republican), and as leaders in Congress. 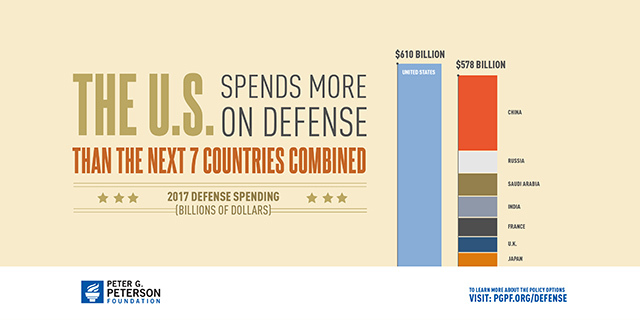 The Coalition, convened by the Peter G. Peterson Foundation and chaired by Admiral Mike Mullen, emphasizes the fundamental link between America’s long-term fiscal health and our national security. The group has released a new statement to draw our country’s attention to the fact that America’s global leadership requires a foundation of economic growth and fiscal sustainability, and to the urgent need to update and re-prioritize our defense and foreign policy strategies to reflect a changing security environment. Watch the video of a panel discussion at the 2016 Fiscal Summit, featuring Coalition Chairman, Mike Mullen, Secretary Chuck Hagel, and Senator Sam Nunn in a conversation moderated by David Sanger from the New York Times. Read the press release for the 2016 statement. View the Coalition’s full page ad which appeared in the New York Times, Wall Street Journal, and Washington Post in December 2012.